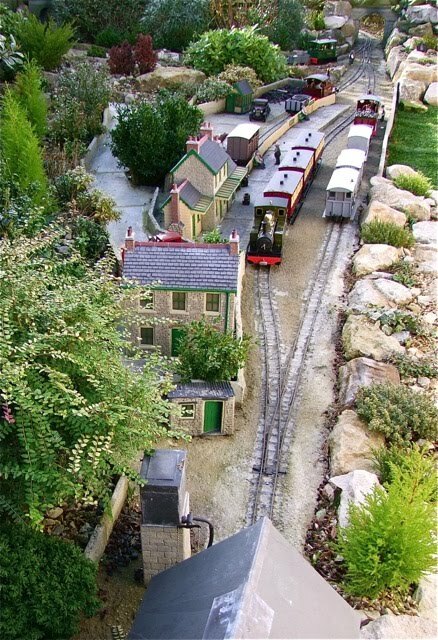 The Summerlands Light Railway is a 32mm line near the Dorset coast in the UK. It is laid on insulating blocks using Peco SM32 track mortared in and ballasted with a grit sand cement mix. Buildings are mostly second-hand refurbished, but the engine shed and platforms are all cut from concrete roof tiles. 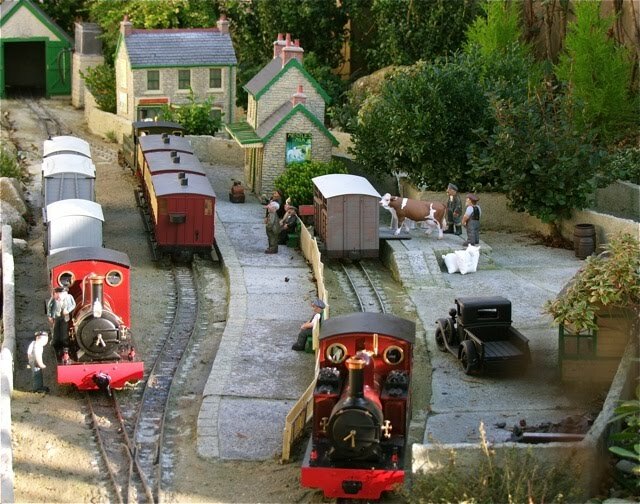 People are an essential part of the Summerlands Light Railway and are nearly all Busybodies from the Rob Bennett studio. The SLR featured in Garden Rail magazine 172 and you can see a scan of this on the Summerlands Chuffer website under "My Railway". Below you can see Watercombe station in the area behind a trellis fence - shown below. The track has just been re-ballasted. And here it is on the same day in Feb 2010 - looking in the opposite direction. You can get an idea of the railway from the video below, which shows Roundouse Argyll Summerlands running in Feb 2010 just as it began to snow. And here is Alex - an modified Cheddar Iver, with Bert Webster, a modified Accucraft Edrig, double heading at Larkbarrow station. This Roundhouse L&B Yeo is in original condition, other than new buffer beams made by the Argyle Loco Works in Australia. The original ones were damaged during its journey half way round the world. Katie Ella was purchased second-hand from an ad in Garden Rail. Shown in action above in original condition, the photo right shows that she now has a matt smoke-box and roof, Chuffer, Roscoe lubricators and lamp. Since this was taken, she has also been converted to 2.4 ghz radio control using the Roundhouse kit ad a Tx/Rx from Giant Cod. Lord Summerlands (the fictional railway owner) surveys the newly ballasted track (3.2.1 grit,sand,cement laid wet) in Watercombe statio. It was replaced after the frost had destroyed the previous grit/cement mix. He is wishing he had spotted that kink before the cement went off! Bert Webster again. You can read the full story of the construction in Garden Rail magazine 174 or see a scan on the Summerlands Chuffer website under "My Railway"
Mighty Mo, seen here fresh from the workshops is finished with Locolines transfer sheets. Anyone would think I like shiny locos! 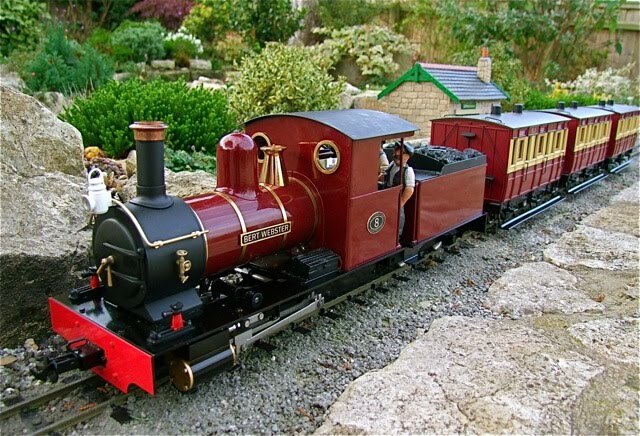 The Don is a Peter Angus model of a loco built by the Balmforth Brothers at Peel Ings Foundry in Leeds in 1898. It has a twin cylinder oscillating steam motor and the outside cylinders are dummy. It caused quite a stir when it arrived (below)and runs like a sewing machine - with a similar sound! Here is Alex again - the much modified Cheddar Iver. No fine scale model this - just a fun-to-run loco now that the 2.4 ghz R/C has tamed his racing tendencies. Mods include side running plates, dome turned from solid but drilled for the filler, buffer beam, cow catcher (a Roundhouse Old Colonial one), larger lubricator with "Bobble Hat" top, handrails, lamp etc. This Roundhouse Fowler recently joined the railway. It is an early one with a megaphone chimney which gives it a very loud chuff from the Summelands Chuffer. It is wonderfully docile and will slog round with a heavy load. Here is a short video of the loco when it first arrived..
And here is Bert Webster again - fresh from the paint shop. 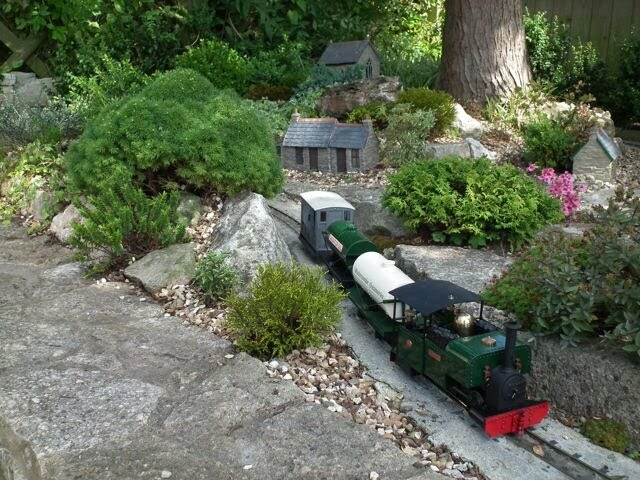 It's funny how things come about - our new TV went wrong so I ended up doing a bit of landscaping on the railway. There was this small area of Hebes which provided a visual break, but they had go rather leggy and needed attention. Liz drew the short straw to wait near the house in case the TV repair man phoned and he was late. To pass the time, she pruned my Hebes - thus removing the miniature wooded area. I could have left it to re-grow - and left the small pile of stone that had been waiting for me to use, but the sun was shining and I fancied a bit of landscaping. I carefully removed the gravel mulch and then dug out the plants. These will all be repotted and grown on for future use. I found one large rock in the station area which had been overgrown and removed this for re-use. The trouble was that this was a bit green, so i swapped it for another weathered rock from another rockery where it wouldn't show. This became the feaure stone. I then positioned the other stones to create a raised rockery bed. When I was reasonably happy, I removed the row next to the railway and dug out a trench about 4" deep. I filled this with a stiff concrete mix and then mortared the stones on to this while it was all still wet, mortaring between the stones as wanted a continuous rock face next to the railway. The row nearest the wall were just laid loose to give me scope to modify and then the centre was filled with a soil/compost mix. I should have waited for the cement to go off really, but decided to plant while it was still flexible. I used a coach to ensure clearance and began to position the plants. 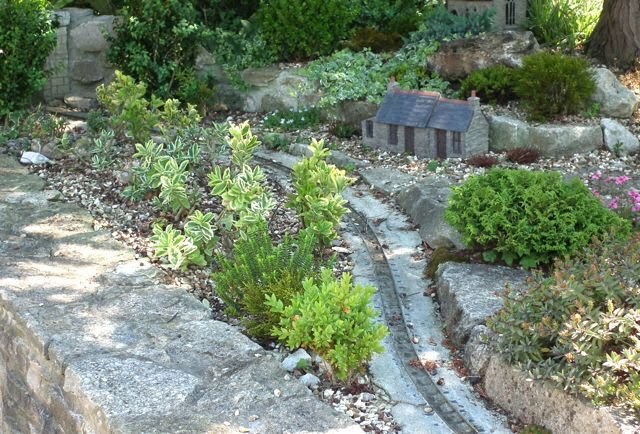 The large conifer had been removed from the main rockery on the railway where it was being smothered by to small leafed Hebes. With the exception of the bluey leafed hebe on the left, everything else was scavenged from the garden. The ivy, from an old hanging basket, was pinned down with wire clips. The gravel mulch was replaced, everything was watered and the mortar kept moist until it was cured. Total time about three hours!